Residential property prices rose 10.6% nationally in the year to May, according to new figures from the CSO. When Dublin records are removed, the price rise for residential properties around Ireland were 1.8% higher in May 2014 than May 2013. The latest Residential Property Price Index compares shows that prices rose by 2.3% in May 2014, compared with a 0.3% increase in May of last year. 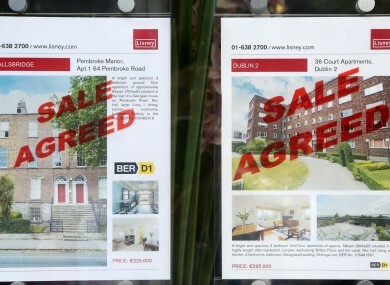 Dublin prices registered the highest increase, with house and apartment prices rising 22% between May 2013 and May 2014. House prices rose by 22.4% over those 12 months, while apartments were up 19.5%. The CSO report notes that house prices in Dublin are 44.4% lower than the highest levels recorded in 2007, while apartments are 53.4% lower. Residential prices outside of Dublin are 47% lower than in September 2007. Commenting on the new CSO figures, Davy Research noted that the overall market remains “exceptionally illiquid”, with prices reflecting a lack of supply. Davy also said that residential housing price inflation has not been driven by mortgage lending as cash buyers still account for over half of the market’s transactions. Cash buyers are being enticed by a combination of rising rents, tax incentives, low interest rates the lack of new housing but are, Davy warns, unlikely to be a longer-term sustainable source of demand. Email “House, apartment prices up 10.6% nationally in year to May”. Feedback on “House, apartment prices up 10.6% nationally in year to May”.